I wish I could remember who gave me this recipe, because it's so good! Make them for a lunch to go, or serve for dinner with a side salad, and even with some fancy Mexican rice! Quick to make, it took me less than half an hour to prepare from start to finish. Heat oil in a large pan over medium heat. Saute onion in oil until transparent. Add garlic and stir. Stir in chili powder, mustard and cumin, then add beans and water/stock. Simmer, stirring, until beans are soft and most of the liquids are absorbed, about 5 minutes. Stir in soy sauce or Bragg. If you like, you can mash the beans in the pot, or leave chunky. Taste and adjust seasoning if desired (maybe a sprinkle of thyme or ground black pepper would be nice?). Preheat oven to 375F. Spread a generous layer of the sweet potato mixture, then top with the beans. (*See Note below.) Roll up burrito, folding edges in from all 4 sides to cover filling (see diagram). Repeat with remaining tortillas, bean mixture and sweet potato. Place burritos seam side down on a lightly oiled baking sheet. Bake for 10 to 15 minutes or until burritos are crisp (it's extra nice if you brush a layer of olive oil on the tops of the burritos before baking, to make them come out golden crispy). Serve garnished with toppings of your choice and a nice salad! Makes about 4-6 burritos, depending on amount of filling. 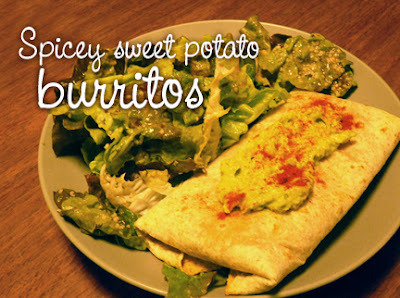 *NOTE: For a burrito to-go, skip the oven baking. At this point, add the filling in a long and thin formation, and add the garnishes as part of the filling. Then simply roll up the burritos by folding up the bottom flap, then the left flap, then roll towards the right leaving the top open. Wrap the bottom half with wax paper or a napkin and you're good to go! KAPHAS replace sweet potato with yam (or white potato); replace kidney beans with aduki beans; if possible use large corn tortillas or other non-wheat tortillas; avoid avocado and use plain yogurt instead of sour cream. Very cool! A recipe that I can follow all the kapha directions by choice! I hate avacados. Once again, you've inspired me, Fran! And thanks, tracker -- I love adding little diagrams and images whenever possible! Could black beans be used in place of kidney? Thanks! i love this recipe so much! My suggestion for sides is Greek Strained Yogurt. I love a little added acidophilus. This recipe turned out well. It's so easy to make too. I'm vata/kapha and the burritto was such comfort food, yet healthy. Thanks. I couldn't find the beans called for in the recipe so I used pinto.